TLV offers a variety of heating solutions to meet your needs. These compact systems are ready for connection to all necessary components for steam side regulation and condensate return. Temperature-sensitive products which must be heated below 100ºC are often heated with hot water, but there are downsides to this. Because hot water systems operate slowly, temperature consistency is difficult, resulting in a decrease in product quality. Using low pressure or vacuum steam, however, alleviates these issues. Even below 100ºC, steam at reduced pressure offers rapid, evenly-applied heating. 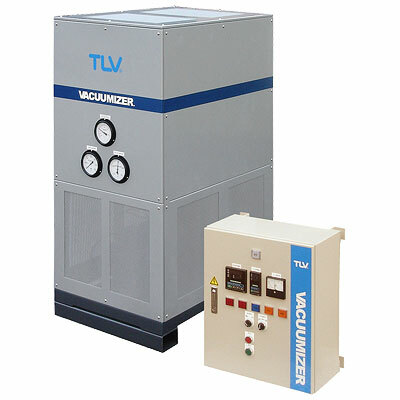 TLV's Vacuumizer system utilises an ejector to adjust the vacuum and discharge condensate while precise pressure and temperature controls ensure a consistent supply of saturated steam. For efficient and safe heating of products below 100ºC, the Vacuumizer system is the ideal choice.